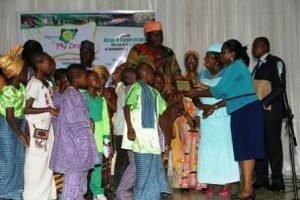 Otunba Olusegun Runsewe, presenting an award to the Best Culturally Dressed School at the 5th Season of Nigeria of My Dream Competition and Events. The Nigeria of my Dream Schools Competition and Events which held on the 1st of June, 2017 at the National Merit and Award House, Maitama was gracefully attended by both Primary and Secondary schools within the FCT. The event showcased talents in various genre such as acting, dance drama, poetry etc and Awards were presented to Schools and Children with outstanding performances.